Pressed Dog Food Switching from your present food to Farm Food HE. You can change your dog’s diet to Farm Food HE in three ways, depending on the condition of your dog’s intestinal flora. When we refer to ‘fresh meat’ then we mean complete frozen fresh food containing sufficient ‘dirty’ or green tripe. Naturally Farm Food Fresh Tripe and Heart Complete contains sufficient unwashed tripe. 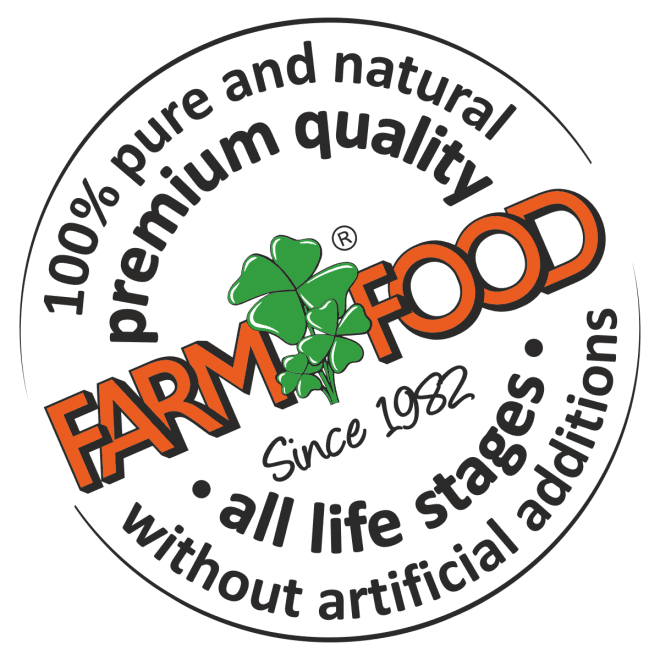 Because Farm Food HE is pressed and your current dog food, probably, is extruded (crunchy), we advise you from the very beginning not to mix Farm Food HE (or Farm Food Fresh) with your current (extruded) dog food. Farm Food HE can certainly be mixed with fresh meat, because they are digested in the same way in the stomach and intestines. Finish your old dog food off therefore, before switching to Farm Food HE. The difference between pressed Farm Food HE and your current extruded crunchy food is not only its composition, but also in the totally different manner of digestion of the food. The crunchy pellets lie on top of the dogs stomach and soak themselves full with stomach juices then dissolve and fall apart (in a favourable case). Farm food HE in contrast is slowly digested lower in the dog’s stomach. For more information read ‘Why, according to us, are pressed pellets healthier for your dog?’On page 13. We advise this method whenever the dog’s system is quickly upset if he or she has eaten ‘something strange’. This is mostly a sign that the intestinal flora needs some maintenance and needs to be built up before Farm Food HE can be digested easily by your dog without problems. When your current dog food is finished, give your dog, for at least 10 to 14 days in succession, only Farm Food Fresh Tripe and Heart Complete (deep frozen fresh meat containing sufficient unwashed tripe). Farm Food Fresh can be obtained at the better specialist pet shops. You give your dog Farm Food Fresh (after defrosting) at room temperature. Do not defrost the fresh meat in the microwave, because microwaves also destroy the good bacteria in fresh meat. After these 10 to 14 days of fresh meat you can slowly switch over to Farm Food pellets by steadily giving less fresh meat and more pellets (50 g pellets is equivalent to 100 g of fresh meat). In addition to Farm Food HE we advise you to give Farm Food Fresh Tripe and Heart Complete one day per week to keep the intestinal flora at a good level. Thereafter you follow the dietary advice as described in our advice on feeding. This method is often used in dog boarding kennels when dogs staying there are fed with Farm Food HE. You too can apply this method if your dog has good, dark, solid excrement. The first day you give a quarter (25%) of the amount of Farm Food HE that your dog would normally be permitted in a day. Do not give anything else in addition, apart from a healthy chew such as Farm Food Rawhide® or Farm Food Antlers®.On the second day you give half as much (50%) of the normal quantity of Farm Food HE.On the third day you give three quarters (75%).On the fourth day you give the full quantity of Farm Food HE that your dog should receive according to the table in our advice on feeding. We advise this method for dogs with highly sensitive digestive systems. First you focus for two weeks on a treatment to build up the intestinal flora, then you slowly switch over during the following two weeks. Therefore for the first 14 days you only give Farm Food Fresh Tripe and Heart Complete to bring the intestinal flora of your dog back up to a satisfactory level. Divide the fresh meat out over several meals per day. The more often and the smaller quantities a dog is given this to eat, the better the digestion and adjustment within the intestine. If the problems are accompanied by serious symptoms of diarrhoea, for the first 2 to 3 days give the dog Farm Food Fresh that has been very briefly dipped in boiling water. You allow the fresh meat to defrost at room temperature and before you give it your dog wash it with hot water that has just boiled, poured over a colander. In this way some of the rawness is taken away. Let it cool off for a while before you give it to the dog! After two or three days give the dog Farm Food Fresh raw. When these 14 days are over you can slowly switch over to Farm Food HE pellets. You can do this by gradually giving less fresh meat and more pellets. So you’re going to replace a bit of fresh meat with Farm Food HE. You can safely mix Farm Food Fresh with Farm Food HE. Make a feeding schedule in such a way that each day you reduce the amount of Farm Food Fresh by e.g. 50 g and add 25 g of Farm Food HE until in the end you only give the dog Farm Food HE. The relation between Farm Food Fresh Tripe and Heart Complete and Farm Food HE is approximately 2 to 1. So 100 gram Farm Food Fresh is approximately equal to 50 grams Farm Food HE.